Performers include: Tom Burke, Howard Charles, Santiago Cabrera, Peter Capaldi, Alexandra Dowling, Ryan Gage, Tamla Kari, Maimie McCoy, Luke Pasqualino, Hugo Speer, and Marc Warren. This historical action drama series is based on the characters found in the novel The Three Musketeers by Alexandre Dumas. Set in Paris in the year 1630, Athos, Aramis and Porthos are highly-trained Musketeers who fight to protect their king and France. Along the way, they meet a young but skilled farm boy who longs to become a Musketeer. Charismatic, impulsive and ridiculously brave, young D’Artagnan (Luke Pasqualino) has exceptional skill with a sword. Athletic and determined, he is also intensely romantic. In time, D’Artagnan will become the greatest Musketeer of them all and a legend in his own lifetime. A natural leader, Athos (Tom Burke) is brave, resourceful and the glue that binds the Musketeers together. He nurses a dark secret in his past and has bouts of solitary drinking. Charming but a deadly fighter, Aramis (Santiago Cabrera) is a handsome man of fascinating contrasts. His love of women is notorious but he’s far from being a routine womanizer. He possesses a deep insight into human nature and puts his faith in a deity who understands and forgives his many contradictions. A great fighter, a loyal friend and a man who lives life to the fullest, Porthos (Howard Charles) was raised in poverty and has overcome many challenges. He finally found his true family in the Musketeers. Intensely loyal to his friends and a natural fighter, he is the go-to guy for hand-to-hand combat and a lively sense of humor — but he is not a man to cross. A legendary soldier, Captain Treville (Hugo Speer) is the leader of the Musketeers and a father figure. He’s a close advisor to the King, and a man of absolute honor and integrity. Good-natured yet weak, King Louis XIII (Ryan Gage) is the absolute ruler of France. Torn between the inexorable pull of his First Minister, Cardinal Richelieu, and the blunter but well-meaning advice of Captain Treville, Louis wants to be a good king but lacks the essential determination and seriousness the role requires. Louis remains loyal to his Musketeers and supports them when he can but is easily influenced against them by the scheming Cardinal. His wife is Queen Anne (Alexandra Dowling), a strong-willed and passionate woman. She yearns for a romantic escape from her waning marriage and a role in the government of France. Louis regards Anne as too serious and is intimidated by her cleverness and wit. Although she is loyal to her husband, Anne is increasingly attracted to the dashing Aramis. Scheming, ruthless and pragmatic, Cardinal Richelieu (Peter Capaldi) may be the most powerful man in France. He is a villain and a power-hungry dictator whose ultimate aim is nothing less than complete control of the country. But in his own eyes, he is bringing much needed order to an outlaw society. He knows the King’s weaknesses all too well and understands that someone must take on the burden of government in his place. The most mysterious and beautiful of villains, Milady de Winter (Maimie McCoy) is the Cardinal’s secret weapon — a deadly and merciless assassin. Brought up in poverty, Milady is a sensual and beautiful woman who ruthlessly uses her charms to achieve her goals. One of the Cardinal’s men, Comte de Rochefort (Marc Warren) is a tempestuous, tortured, and obsessive man who nurses many dark secrets. His sudden return to France is a surprise to all. As an old acquaintance of the Queen, he is warmly welcomed into the Royal Court but his disdain for the Musketeers may ultimately be deadly. Yearning for escape from her uneventful marriage, Constance Bonacieux (Tamla Kari) finds excitement, romance and danger when D’Artagnan comes crashing into her life. She becomes an integral part of the Musketeers’ adventures and a resourceful ally and companion. The day will come when she will be forced to choose between her loyalty to her husband and her undeniable attraction to D’Artagnan. For now, she is having the time of her life. Grimaud declares war on the Musketeers – starting with the people they love. Still blinded by grief, will the Musketeers see him coming before it’s too late? First aired: May 14, 2016. What do you think? Do you like The Musketeers TV show? Do you think it should have been cancelled or renewed for a fourth season? this was a good story, great actors, and overall a really great series. I AM SO DISAPPOINTED that it was cancelled. We so looked forward to another season and constantly looked online to see when it would be coming back only to find out it was done. I agree, A f*cking joke is it. The series was great. Had a great messege. Friendship, loyalty and so on. And they made great actually. The musketeers never dies and they also show there feeling. That was great. BUT WHY end it?! I still dont get it. Everybody sign up and get all your friends and families to join in. “The Musketeers” bring me such Joy ! The Loyalty, The Passion.would love more seasons please. #LukePasqualino. Enjoyable show. Loyal, generous characters make this a fun show. Sorry the show was cancelled. It wasn’t like a lot of stuff today. The Musketeers are easy on the eyes, too. 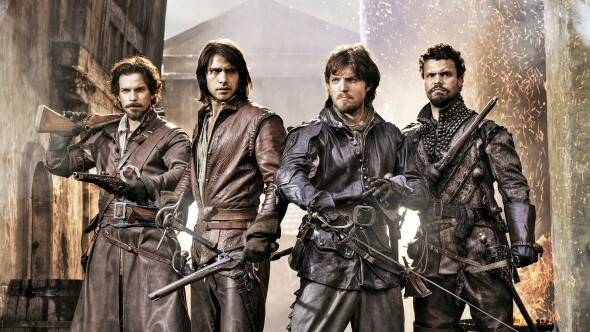 I love the Musketeers. The show has adventure and romance. I love to welcome the guys to my house. This is quality programing. Please continue the program. I love this series please renew it, it’s one of the best on the bbc – and they don’t have a lot of great series. In fact the bbc are way behind on good tv but that probably because when you do get a good series they end it!!! Maybe another network take it on please. Loved this series! Why do they cancel the good ones & leave the garbage? Please rethink!